A pedestrian and traffic-free zone (zona peatonal) for most of its length, the Calle del Arenal is one of the 10 streets emanating from the Puerta del Sol Square. It is one of Madrid's busiest thoroughfares, with a variety of shops, including gifts and souvenirs. However, because it joins the Puerta del Sol with Plaza Isabel II, Plaza de Opera and the Palacio Real (Royal Palace), you are still likely to encounter some traffic. Apart from the shops, there are plenty of cafes and restaurants where you can take a break, and also hotels, apartments and hostals for overnight stay, making this one of the most centrally placed areas of Madrid. The name of the street is derived from the word "arena", meaning "sand", and refers to the sandy banks of a small stream which flowed along this route in mediaeval times. During the time when the Moors ruled this part of Spain, from the 8th to the 12th centuries, this was the district where the Christians lived, and it later because an area for wealthy residents. The street contains a plaque and small museum as a memorial to a Spanish icon, Pérez Mouse (Ratón Pérez), the subject of a story written by Father Luis Coloma (a Jesuit priest who wrote novels and children's stories) for the young King Alfonso XIII when he lost a milk tooth. The author located Pérez Mouse's residence at number 8 Calle Arenal, and the story tells of the mouse's adventures leading the young king through the city along hidden routes to see how his poorer subjects lived, so that he could develop the generosity appropriate to a sovereign. The story is based on a tradition where a mouse is the equivalent in Spain of the tooth fairy. The museum is open Monday to Saturday from 10.30am to 2.30pm and 4.30pm to 8.30pm. Amongst the attractions in the area is the nearby Convent of Las Descalzas Reales. The convent occupies the site of the former mansion of the Emperor Charles V and his wife, Isabel of Portugal. Their daughter, Princess Juana, founded the convent in 1554, later retired there, and was buried there when she died. The convent contains an impressive set of Brussels tapestries and a number of 17th century frescoes. The Church of San Ginés is also worth a visit in this area. It has paintings by Alonso Cano, and its major attraction is El Greco's "Jesus expels the merchants from the temple", considered to be one of his best works. Close to the Church and just off the Arenal Pedestrian Zone is the San Gines Chocolateria , a popular place to take a late night or early morning snack of churros and hot chocolate (sticks of fried dough dipped into thick chocolate). 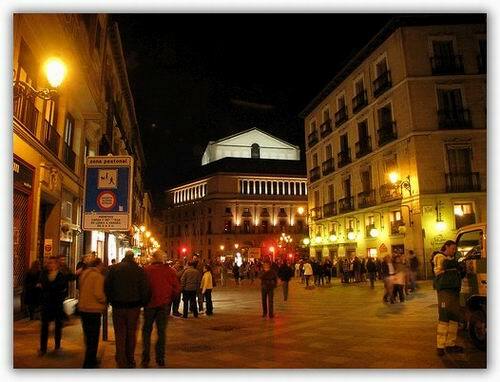 The best metro stops for the Calle de Arenal are Opera, at one end of the street, and Sol at the other. The first part of Arenal street, towards the Puerta del Sol, is well known for the abundance of shoe shops - small stores lining the street stocking shoes and boots of every size and shape. This area is home to hundreds of bars and restaurants, as well as theatres and also famous discotheques such as the Palacio de Gaviria and Joy Eslava. Continue to Part 2 for more information about Calle Arenal.